Expert tips for Vienna’s best accommodation, dining, shopping and tours options. A useful guide for Vienna travelers. Vienna, Wien in German, makes you feel in a fairytale. You can smell Wiener Mélange in every corner of the city while your ears are stimulated by the classic music notes. Wien, homeland of Mozart has the harmony, Wien the homeland of Sigmund Freud has the profoundness, and Wien the homeland of Klimt has the aesthetics. You may want to taste the best desserts in the shadow of a splendid baroque building or you can take a ride with a nostalgic carriage around this magical city. Classic music concerts, balls and valse are the parts of the daily life in Wien. This city is full of art, music and history and you never feel you have enough of them. With the population of nearly 1.7 million, Wien remains the capital and the largest city of Austria. Besides, it is one of the largest cities in Middle Europe. Vienna is seducing and you just do not want to resist her. Just let yourself go with the flow there. She will give you more than you need. The world’s 2nd most livable city according to Economist Intelligence Unit’s survey of 140 cities, Vienna blinks at you to discover her charming points. Cool may be the weather in some parts of the year, Vienna will make your heart warm. Dignity, music and dreams unite where Vienna is. Along with its central location in the east of the country, Vienna is near to the borders of Hungary, Slovakia and Czech Republic. Many major airlines have direct flights several times a day to Vienna. Schwechat Airport is located approximately 18 km east of Vienna and provides many options to reach the city center. ÖBB (Austrian Federal Railways) provides a very modern railway network and trains so that you can travel safely and in comfort to Vienna. You can have detailed information on ÖBB’s website. With 5 underground lines, 90 bus routes, nearly 937 km route network and 28 tram lines, Vienna provides an easy and comfortable way of city transportation system. You can check the Vienna public transportation map and find your way easily! The birthplace of Marie Antoinette and the official residence of Austria’s president, is one of the prominent landmarks of the city. 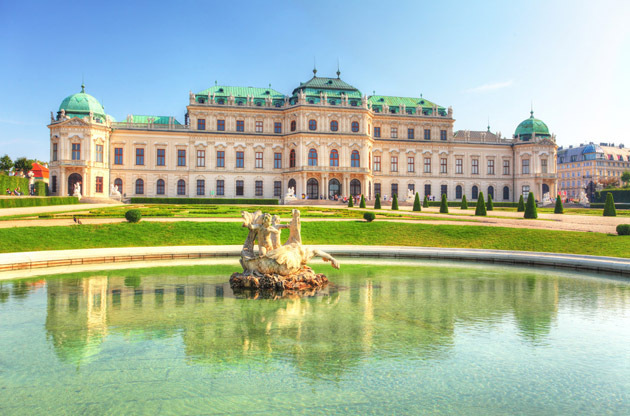 The Belvedere, Schönbrunn Palace and Sigmund Freud Museum also awaits you to fascinate with the admirable artifacts and memories. The Wiener Prater is the home for the world’s oldest amusement park Wurstelprater. Prominent landmarks such as State Opera, Museum of Fine Arts, Natural History Museum, Burgtheater and the Parliament are located here. When walking around the city, there will be especially something that attracts you most: The gardens. Vienna is notable for the beautiful gardens of the palaces or on their own, and they are decorated meticulously. Do not forget to take your time in these captivating gardens and get amazed by the magical landscape designs. Vienna offers you a great variety of restaurants where you can experience incredible tastes. An Australian restaurant Coburg, a schnitzel restaurant from heaven Figlmüller are some of the best choices. Do not leave Vienna without tasting schnitzel not to deeply regret afterwards. You may also like to try Heuriger, traditional wine taverns of Australia where you can taste delicious homemade wine and cold food. Credit cards are widely acceptable though in some places it can be subject to minimum purchase amount. You can choose Golden Quarter for the luxury brands, Kaufhaus Schiepek for the unique souvenirs for your beloved ones and Kohlmarket that is also known for being called “home” by Haydn and Chopin. The famous chocolate shop Demel, Bulgari, Rolex and Gucci are only some of the brands that you will encounter in Kohlmarkt. With the Twin City Liner, you can go from Vienna to Bratislava in only 75 minutes on the Danube River. For detailed information please visit Twin City Liner’s website. Klosterneuburg Abbey awaits you with its treasures of sacred art. For the detailed information, please visit the Klosterneuburg Abbey’s website. If you want to taste the cult movie The Third Man’s atmosphere you can join one of the Third Man Tours to plunge into Harry Lime’s city. Vienna Card is very useful if you will stay in the city for at least 3 days. It provides you with 72 hours of free transportation in the city and more than 210 discounts in museums, shops, theatres, even in the famous wine taverns, Heuriger. For detailed information please visit the official website of Vienna PASS Card. If you need to exchange money, try to do it at a bank since foreign exchange booths may charge high fees. If you want to go to a philharmonic orchestra, an opera or a major touring acts, you’d better book your tickets beforehand since they sell out quickly. Thanks to its central location in Europe, Vienna is one of the highly preferred cities for events like congresses, fairs or conferences. You can travel to over 180 different destinations from Vienna International Airport and accommodate in over 180 hotels that offers you great comfort during your trip. Having also notable and modern facilities for even very large scale events, Vienna hosts nearly 1700 events annually.